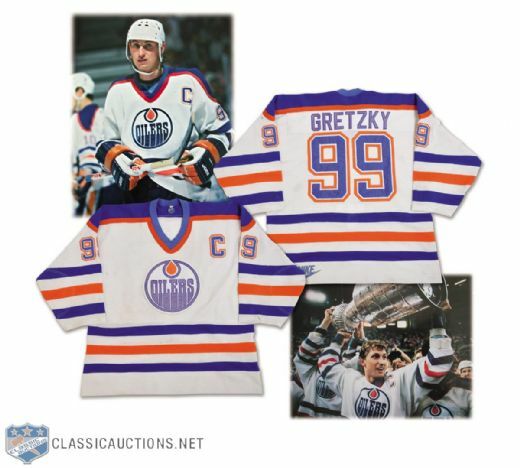 What would you rather have; Wayne Gretzky's 500th goal game-worn jersey or the Great One's Edmonton Oilers gamer from the 1987 Stanley Cup finals? You can have both with one winning bid because they are in fact one and the same! 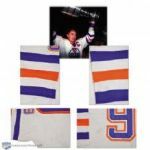 Wayne Gretzky wore this extensively photo-matched Oilers home white Nike Alpha mesh jersey when he hoisted the Stanley Cup over his head at Edmonton's Northlands Coliseum for the third time in four years on May 31, 1987. Probably the most important Gretzky jersey ever offered, according to collectors and experts, it is the same one the Great One was wearing on November 22, 1986 when he became the 13th and fastest member to join the NHL's elite 500-goal club, capping a five-point night against the Vancouver Canucks with a hat trick goal into an empty net to reach the milestone in his 575th regular season game. Gretz got plenty of great game use out of this magnificent mesh during a 62-goal, 121-assist, 183-point season. It was still on his back when he and the Oilers ran through the 1987 playoffs to take on and beat Ron Hextall and the Philadelphia Flyers in an electric seven-game final. Clearly matched to photos of Wayne from the final and celebrating with the Cup, the jersey has only recently been matched conclusively to photos from Wayne's 500th goal game thanks to review of video from the game that identified two fans sitting a few rows apart in the visitors' end of the rink, both wearing a bright, very distinguishable white and blue, horizontally-striped shirt who are present in photos from the game, as well as an unusual combination of players on the ice after a third-period goal by Jari Kurri. Video that shows Gretzky, Kurri, Craig MacTavish and Mike Krushelnyski, an odd combination that came about because a penalty had just expired, skating up the ice just after that goal was scored establishes the photo from Wayne's 500th goal game. Nike size XL and slightly washed-out "L" flag tags remain in the back of the neck and the Nike logo is screened on the left rear tail. Fight strap loop is sewn inside the back and Wayne's custom Velcro strip is sewn onto the inner hem. The sleeves were custom-shortened at some point during the regular season subsequent to Wayne's 500-goal game. 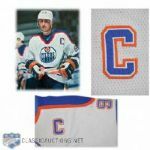 This amazing Gretzky 1986-87 Oilers game-worn jersey from a season that saw Wayne win his record eighth straight Hart Trophy and seventh straight Art Ross while leading Edmonton back to the NHL summit comes with an Oilers/MeiGray LOA plus an extensive authentication document. Please take note that this lot may be subject to a silent reserve. There are several distinct and detailed matches on the jersey to the famous dressing room photo of Wayne holding his "500" goal puck. The number of mesh holes running diagonally in the middle of the captain's "C" on the left breast and the mesh hole pattern along the bottom with the last few holes disappearing under the C are perfect matches, the equivalent of a fingerprint match as no jersey would have the same mesh hole pattern. The small white thread sticking up from the orange trim on the C is also visible. The Oiler drop on the crest is very significant, as well. The shape of the orange oil drop in relation to the surrounding white space and blue trim is always unique on 1980s-era Oilers Nike jerseys as each piece of tackle twill was cut and sewn by hand and never exactly the same on each jersey. The Oilers crest on Wayne's 500th goal jersey is no different. The top left corner of the orange oil drop is noticeably closer to the blue trim than the right side of the orange oil drop, with much less white space at the top left peak of the drop compared to the top right peak, and the outer edge of the orange oil drop is not symmetrical, with various dips and bumps, nor is the blue trim. Another Bob Mummery photo of Wayne taken from the same dressing room sequence shows the wear on the right sleeve cuff. The large black stick mark that appears on the right sleeve in this photo is not visible on the jersey Wayne is wearing in the 1987 Cup finals and the sleeves are not the same length because Wayne had this jersey's sleeves shortened a couple of months after his 500th goal game, which cut the distinct black stick mark off of the jersey. The small repair on the right sleeve, between the last blue stripe and the second last white stripe, shows in three photos of Wayne, including one each from his 500th goal game and the 1987 Cup finals. This confirms the shortened sleeves. The 500th goal game photo is matched to the fans wearing the striped shirts, which is video-matched. The distinct black stick mark on the left sleeve, near the #9, that shows in a can still be seen on the jersey. A magazine photo from the Oilers' game against Philadelphia on December 28, 1986 shows that Wayne's sleeves had yet to be shortened. The cover photo shows four nice black stick marks on the jersey, including the aforementioned mark near the 9 on the left sleeve visible in the 500th-goal game photos. The other three marks in this cover shot were not on the jersey on November 22. The black mark on the left shoulder near C was lightened from washing but is still very visible; the stick mark on the body of the jersey, through the orange stripe, has almost been completely washed out, but is still visible; and the small black mark through the "O" in the Oilers crest remains on the jersey throughout the rest of the entire season up to and including a photo of Wayne hoisting the Stanley Cup. Auction closed on Tuesday, June 18, 2013.